October 3, 2017 - Lyndex-Nikken is now available on MachiningCloud. Over 2,000 tool holders can be found on the Cloud. Lyndex-Nikken is a manufacturer of toolholders, rotary tables, right angle heads, live and static tools. MachiningCloud is a product data provider for cutting tools, CNC machines and workholding. The Lyndex-Nikken MachiningCloud partnership utilizes the convenience of cloud-based technology, which enables customers to optimize the way they gather information for their manufacturing operations by effortlessly searching for the proper cutting tool that best fits their cutting conditions without having to search through catalogs or multiple websites. Furthermore, Lyndex-Nikken customers will be able to increase productivity and achieve greater accuracy by easily downloading descriptive, usage and geometric information directly into their shop floor software, such as CAM, simulation, and tool management systems. 'We're excited to develop our partnership with MachiningCloud to further enhance access to our technical information for our products', says Scott Irie, Product and Marketing Manager for Lyndex-Nikken. 'The ability for Lyndex-Nikken customers to feed product data directly into their shop software offers a tremendous benefit over paper catalogs and websites as MachiningCloud eliminates the need for manual entry', says Pierre-Francois Tavard, Senior Product Manager of MachiningCloud. 'Finding the right cutting tool quickly and reducing the time to assemble the optimum combination of tool components will enable customers to save time and improve their shop's workflow'. Together, Lyndex and Nikken represent the best of both sides of the manufacturing industry: extreme quality and advanced technology. While Lyndex-Nikken has a long history of success, its roots come from two different companies. 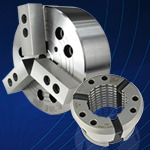 Lyndex Corporation set the standard for quality toolholding and the product line has vastly evolved. Nikken Kosakusho Works, Ltd. was established in Japan a half century ago and has a rock-solid reputation as the number one manufacturer of toolholders and machine tool accessories. In 2002, Lyndex merged with Nikken Kosakusho Works Ltd, and today, the company is focused on innovation and technology of the future. Lyndex-Nikken's industry-leading design and capabilities creates ground-breaking tools and machine tool accessories that will perform with amazing precision and reliability. The company's products simultaneously offer the highest possible level of performance while providing the lowest cost-per-part for customers. For more information, visit www.lyndexnikken.com.